Buses, not trains, will serve Highland Park, Southwest Museum and Heritage Square stations of the Metro Gold Line this weekend. Just to be sure, plan 20 to 40 minutes extra to get where you're going. Repairs to the overhead power system at the Southwest Museum Gold Line Station will get underway after 9 p.m. this Friday and are expected to be completed by the close of service on Sunday night, well in advance of the Monday morning commute. In the meantime, Metro buses will shuttle Gold Line passengers between Highland Park, Southwest Museum and Heritage Square stations during the time it takes to complete the maintenance. The repair work will make it necessary to shut down the power for all three stations. Without the power system, Gold Line trains will not be able to operate in the affected segment. Passengers will be asked to exit the train and take a waiting shuttle bus to the next operating station to continue their train trip. It’s a good idea to plan for an additional 20 to 40 minutes to get to where you’re going. 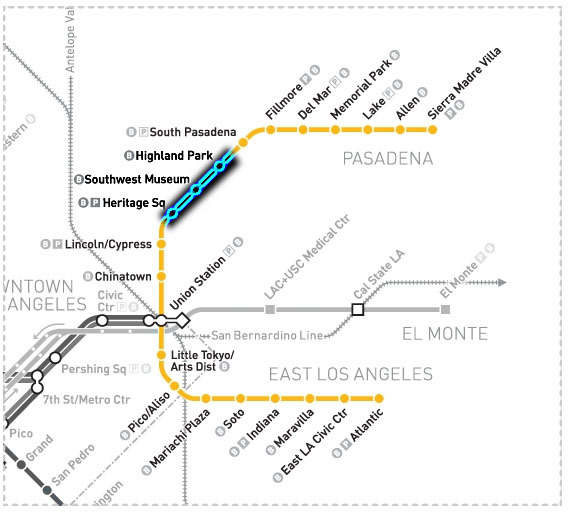 Normal train service will run between East Los Angeles and Heritage Square and between Highland Park and Pasadena. Will the bus bridge be in effect throughout the weekend, or only after 9pm and through the night on those days? James: The bus bridge will be in effect the entire weekend, beginning after 9 p.m. on Friday night and all day Saturday to close of service and all day Sunday to close of service. We expect the maintenance to be completed well in advance of the start of service on Monday morning. Anderson is why are the gold line is close due to for the bridge do all the busses will use a detour for the train station where are the bus will use another station? The idea that a bus bridge involving three stations located about three miles apart on evenings and weekends would cause delays of 20 to 40 minutes is ludicrous. You could almost walk it faster. Buses serving the affected stations will have stops adjacent to that station. Staff will be posted at Highland Park and Heritage Square stations to assist riders. Wayfinding signage linking hte station entrance and the bus stop will also be posted at Southwest Museum Station. Southwest Museum: Marmion Way on the northside of the station and adjacent to the station entrance. Heritage Square: Pasadena Avenue and French Avenue, which is on the northeast side of the station. You’re correct. We’re attempting to communicate that this could represent the entire added trip time passengers may experince from the time they leave their home to the time they arrive at their final desination. Buses will be waiting for passengers for each train arrival at Highland Park and Heritage Square, and the bus trip time should not be more than about 12-15 minutes; however, downstream connections might be missed. The 20-40 minute estimate is a worst case scenario and may only occur during latenight hours when regular train service runs only every 20 minutes. While I missed the convenience of the trains this weekend, living next to the Gold Line, I have to admit loving the eerie silence caused by its absence. In fact, I think this was the first time since it opened in 2003 that people along Marmion Way in Highland Park could sleep with their windows open and not be woken by the train honking at each avenue as it passed. Thanks Metro.